In the latter days of our Game of Thrones Tarot project, artist Craig Coss sent me a hand-cut deck before publication. Which meant I could get reading right away (after I did my ecstatic dance and phoned everyone, that is). Since then, December 2016, I’ve been reading with Game of Thrones Tarot virtually every day. My reflex deck is the Rider Waite Smith. I use others, too – my Art of Tarot, the brilliant Santa Muerte (perfect for a Scorpio like me) and the Wild Unknown– but I’m always returning to base, to the Rider. So for every reading, I carried both GoT and RWS (there’s an anagram in there, somewhere – grot, grows, and TWOs). Hmm – a two-deck spread, perhaps. Rather than work with each deck in turn for client readings, I integrated both into one spread. So, here’s how I I’m reading: I lay down a spread of Rider Waite Smith, interpret the cards, then repeat, overlaying with Game of Thrones. And it’s curious what comes up. There’s often a doubling-up – the same card in the same position, or the same card in another position. After one hundred or so readings this way, an average of two to five cards repeat. When this happens, it’s as if the Universe is highlighting which cards warrant more attention. The GoT’s the kick to go back to the imagery, because there’s more to know. I’ve also found that the GoT layer of the reading, in its doubling, shows cards that are actionable – issues that can be faced, opportunities to be taken. So, the effect of double-reading is, on one hand, compression and emphasis: we note the cards that repeat in the second lay. And on the other, fluidity and development – reading in the space between two non-matching pairs to see what might emerge. Lay the first spread using deck 1. Interpret, with feedback from client, as usual – or however you do your readings. Overlay with deck 2. Do these cards take the reading further? Is there more to interpret? If so, you can see these cards as additional to your first reading. Note any matching pairs, whether in the same position in the spread or not. For example, you might have a Three of Cups in the past position, and a Three of Cups in the hopes and fears position in a Celtic Cross. Take your focus back to the Three of Cups in the first layout, and see if there’s more. The repeat cards in the second layout act as signposts back to their position in the first layout. See any repeated cards as potential ‘action’ cards. Look at the non-matching pairs. Consider if these represent internal/external realities, as above. To expand the reading, focus on one card position in the spread and choose a third card from either deck as ‘likely outcome’; threes deepen the story. Of course, there’s no set system here – it’s very much a starting point (and some of you out there will already have your own methods of reading with two decks). 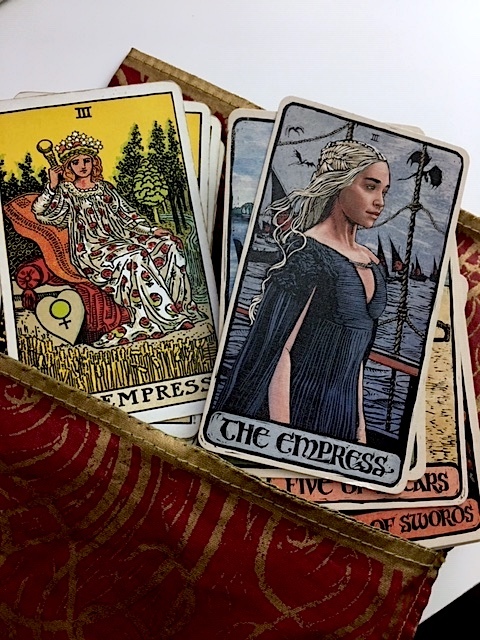 But so far, I find it brings the best of both my Rider and Game of Thrones Tarot in one, and I get to see how the different energies of each deck operate. Using an ‘old’ deck and a new one also means reflecting your own tarot journey. Like books, I identify each deck with a different period in life. I’ll be reading in Perth, Melbourne and Sydney this May, double-style, and giving workshops, too. Then the London Tarot Festival on June 1, and the TABI conference in July – see the home page for info.